The Convenience Distribution Group is delighted to congratulate Nick Baker of Jet Abbeyside Service Station, Selby, North Yorksire for winning the Best Car Care and Lubricants Outlet at the Forecourt Trader of the Year Awards. The CDG supplied store features a great modern convenience store which caters for its motoring customers with a range of essentail car care products. 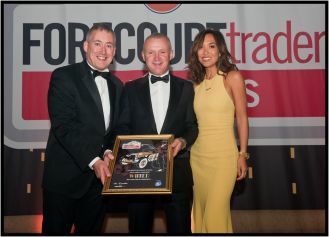 Nick is seen picking up his award from Awards host Myleene Klass and Graham Tissiman, Sales and Marketing Manager of the Convenience Distribution Group. Gulf Retail has announced a distribution and marketing tie-up with Convenience Distribution Group LTD (CDG) commencing 1st October that will improve the lubricant offering for Gulf Dealers nationwide, including faster delivery times and no minimum order requirement. The partnership with CDG, specialists in the distribution of brand leading products to the national and independent forecourt and convenience market, includes dedicated visits to every Gulf Dealers from its experienced sales team to improve product marketing and increase revenue potential. Motorists and Dealers will have access to a new online ‘lubricant finder’ which allows them to input a vehicle registration number to find out exactly which Gulf lubricant they require. With the onset of Winter there are now great opportunities to take advantage of the inclement weather. Check out the new Winter Products and Winter Clothing Brochures from Convenience Distribution for ideas how to maximize sales in the coming months. The Health Care Category is an extremeley important sector for the motorist on the move and offers the retailler a great way of satisfying his customers demand. Check out the new CDG Health Care Brochure which is full of brand leading products. Download below. The Convenience Distribution Group has launched 3 new Health Care Planograms ranging from a basic display of 0.5m by 2 shelves up to a fully comprehensive 1 metre by 3 shelves. Commenting on the new Planograms, Graham Tissiman, Sales and Marketing Mangager of the Convenience Distribution Group said, "Health Care is an important category for Forecourts and Convenience Stores backed by big brands and catering for a real need amongst consumers. We belive that our Planograms help maximize the sales from this area with clear areas for various sub-categories such as pain relief, cold and flu,indigestion, first aid and children's health care. Backed by our professional on the ground sales force who are always on hand to offer expertise and advice we believe CDG is the ideal partner to fully expoit the health care opportunities"